Clean and chop the head of cauliflower up into smallish bits, don’t spend a lot of time on this, just chop it up. Toss into a pot with barely enough water to cover, bit of salt, cover and let simmer until the cauliflower is mushy. Toast, or better yet, grill the bread slices. 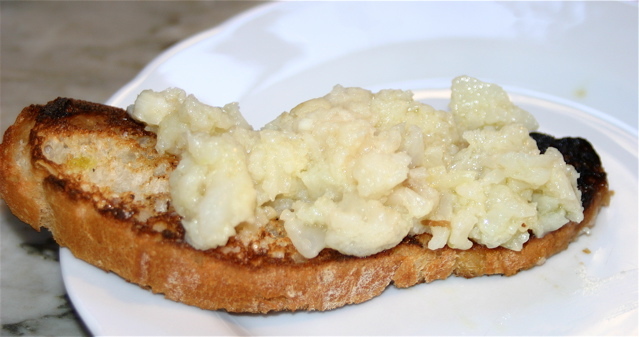 While they are still warm, rub the bread with a raw garlic clove. Rub gently, its stronger than you think. Resist the urge to rub both sides of the bread. Drizzle with a little olive oil and a sprinkle of salt. Drain any remaining water from the cauliflower, give it a good mix and mush it up a bit more. Drizzle with some olive oil and serve with the garlic bread slices. 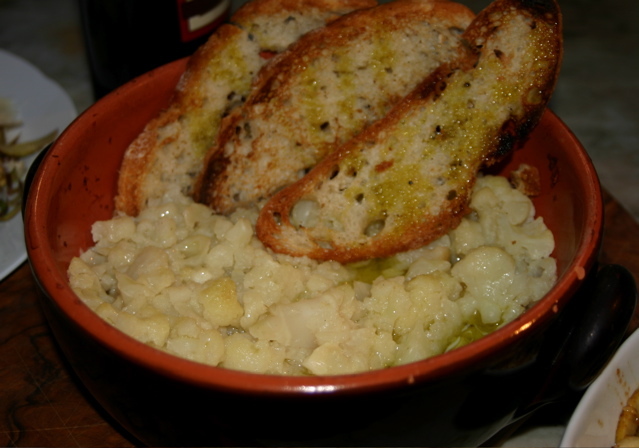 A variation on this is serve the bread in a bowl of chicken broth and then put the cauliflower on top.